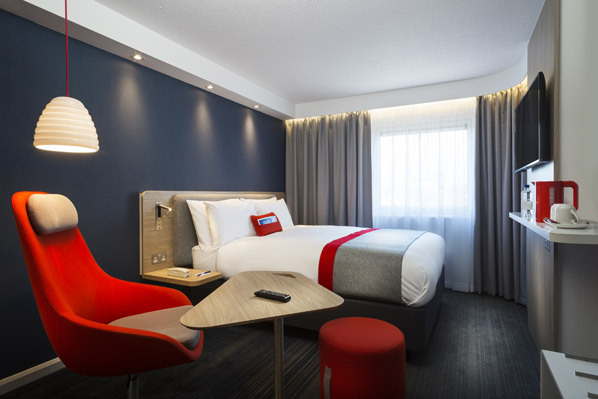 InterContinental Hotels Group has unveiled its ‘next generation’ guest experience for its Holiday Inn Express brand in Europe. Based wholly on guest insight, Holiday Inn Express’s next generation guest experience is being developed with industry-leading experts to meet the changing needs of today’s ‘Smart Traveller’. In order to stay ahead of guests’ expectations, the hotel lobby, dining area and guest rooms are being redesigned, the brand’s service delivery completely revamped, a new food and beverage concept tested. Focusing on offering the most innovative and efficient technological solutions at every stage, the latest smart technology is also being piloted. Some of the key features of the next generation guest experience will see rooms fitted with Smart TVs that enable guests to stream their own media from a personal device or log in to apps such as Netflix using the hotel’s free Wi-Fi. The room also features a flexible work/rest corner where the traditional desk has been removed and replaced with a comfortable chair and table which can be moved around the room which has multiple USB ports to charge devices. A larger, cosier, bed with a padded noise-reducing headboard taking inspiration from a business class aeroplane seat takes centre stage. Mobile check in is also on offer through IHG Rewards Club, where members are able to check in through the IHG App or online prior to arrival. When they arrive at the guests are shown their room location and its proximity to the stairs, elevators and emergency exits via tablet screens. Mike Greenup, vice president, brand management, Holiday Inn Brand Family, Europe, IHG said: “A hotel room is no longer just a place to sleep and our approach to technology and service starts with understanding our guests and their needs across the entire guest journey. Holiday Inn Express is a brand grounded in global insight and each element of the ‘next generation’ experience is a direct response to guest feedback. As well as front line hotel staff, owners, and hotel experts, IDEO interviewed different ‘Smart Travellers’, both business and leisure, people who travelled on their own, or as couples and families. They spoke to guests staying in IHG’s hotels and competitor hotels and spent time with guests in their homes, observing how they packed and what they packed for a short stay. The team walked guests through a full-sized mock up of the new Holiday Inn Express guest experience, which included acted-out service roles, digital touch screens, and food and beverage offerings. During each walkthrough, guests were invited to give feedback that was incorporated to refine the experience.